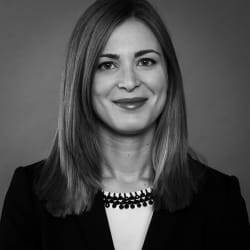 Dafni is an associate in Herbert Smith Freehills’ Brussels office dealing with various areas of EU competition law, including merger control (M&A and joint ventures), cartels, antitrust investigations, compliance programmes and distribution agreements. Dafni has advised clients active in a broad range of industries, including pharmaceuticals, retailing/consumer goods and financial services. Dafni has particular expertise in the pharmaceutical sector and she has advised a number of pharma companies on licensing agreements, patent settlement issues, life-cycle strategies and merger control issues. Dafni holds a masters of law from the University of Cambridge. Prior to joining Herbert Smith Freehills, she worked as a trainee in another international law firm in Brussels and completed a traineeship at DG Competition of the European Commission. Dafni is qualified as a Greek lawyer and as an Advocaat in Belgium.